Mr. N Srinivasan (president, BCCI), Mr. Wally Edwards (chairman, Cricket Australia), David Richardson (chief executive, ICC), chief executives of the Australian and Sri Lankan Cricket boards, Michael Clarke and the Australian cricket team, Mahi [MS Dhoni] and the Indian team, some of my former team-mates and other former cricketers, ladies and gentlemen. That was the easy part. Now comes the difficult part. And the difficult part is that right till the Nawab of Pataudi jr passed away, I never knew how to address him. The first time I played under him was for the Vazir Sultan Colts XI in the Moin-ud-Dowla Gold Cup. The Vazir Sultan team used to comprise players who were doing well at school and inter-university level. We used to have the odd first-class player, but generally it was a team of young players trying to make their mark in first-class cricket in India. Some of them, like me, hadn't even played first-class cricket. So we were all very excited to be playing under the captain of the Indian team. Nawab of Pataudi had been captaining the Vazir Sultan team for a couple of years. So, it was a huge excitement, and a great time for us to be there. On the eve of the match we had a cocktail party given by the chairman and the managing director of the Vazir Sultan Tobacco Company. We put on our best attire and went for the party, hoping to come across and meet our captain. Nawab did put in a brief appearance, had a quick drink with the chairman and the managing director and before we could introduce ourselves to him, he was gone. We were about 16 years old at that time, socially challenged, and so we were in one corner. All the executives of Vazir Sultan were in another corner, and we never got the opportunity to speak to Tiger. There were one or two who had played the previous year with Nawab of Pataudi and we were all in a bit of a dilemma as to what to call him. The ones who had played with him in the previous year were of no help as well. So eventually the team decided to get into a huddle in which we were debating and discussing as to how we should address the Nawab of Pataudi. None of us could zero in on how we should address him? So eventually we decided that whoever did well the next day - if you were a batsman and got a fifty, if you took a wicket or a catch - that person's responsibility was to ask the Nawab what we should address him as. The Nawab came just 10 minutes before the toss was to take place and sat on the massage table. There was a masseur who came and gave him a massage and we were in one side of the dressing room, still waiting to be introduced to the Nawab of Pataudi. He wasn't even sure who we were - who was the batsman? Who was the bowler? We lost the toss and went out on the field. As luck would have it, there was a run-out and I was the one who had affected it, so all the players fielding in the vicinity gathered together. The Nawab was sat on the ground tying his shoelaces. There were four-five of us around him. And suddenly I saw the eye-contact being made with me by them. I was pretending as if I didn't know anything. Then of course, there was a bit of a whisper 'ask, ask ask'. So it was my turn to ask him because that's what we'd decided the previous evening. I gathered up enough courage and said, 'What do we address you as? Nawab saab, captain, skipper, Pats, Tiger?' These were all the names that we'd heard him being addressed as by various other people. But we were all kids. The Nawab finished tying his shoelaces, looked up at me, turned and went away. So, we were none the wiser. I met him several times after that. I spent a lot of time with him when I got into the Indian team. But I could never actually call him anything. Every time there was an opportunity to talk to him, I went directly to him, instead of calling him by any name. So that really is going to be the tough part today. I did manage to speak to saiba, Sharmila. She is unwell so she wasn't able to come. But just because he's addressed by just about everyone in their conversations, be it cricket or anything else, as Tiger, with your permission, I am going to address him as Tiger. Tiger was an extraordinary cricketer. To be able to play cricket with just one eye - and the splinter that went through his eye, you could actually see the scar in the eye when you were close to him - and score almost 3000  runs is something terrific. I mean, it's hard enough to see the cricket ball with two eyes, and here was a man who played with just one! He used to bring the peak of his cap over his right eye almost as if taking the sun out of the equation, closing his eye, and he would play. He had a very wide two-eyed stand, not quite Shivnarine Chanderpaul, but almost there. And it was incredible how he could play shots on both sides of the wicket. The best thing about Tiger was that with his batting style and his approach to the game, he liberated Indian cricket. Till then Indian cricket was more about letting things drift than making things happen. Tiger changed the entire outlook and mindset. He stepped down the pitch to the spinners and lofted the quicker bowlers over the infield, which wasn't done before. Yes, India started playing Test cricket in 1932-33 with two very aggressive players in Col. CK Nayudu and the one and only Lala Amarnath, who could hit the ball anywhere. But after that Indian cricket went into a state where it was about making sure things were pretty much status quo, rather than making things happen. Our batting cricketing upbringing was such that if you hit three balls six inches above the ground, your coaches would make you run a lap of the ground as punishment with the bat held high in the air. And therefore, caution was probably the watch-word rather than aggression. And Tiger changed all that. He changed all that by being bold, by taking on the bowlers rather than being dictated by them. And he changed the entire mindset. India was a team which was being run-over by just about every other team. But when Tiger came in, he gave the team the belief and the confidence that they could play against any opposition, do well, and even go on to win. His charisma was such. It was incredible. He was one of those cricketers that you could never take your eyes off. If he was standing at covers and the action was going on in the middle, you would be looking at Tiger Pataudi. Yes, to a peripheral vision you were watching the action but he had that magnetism. He was very good-looking as well. I keep saying that the 1960s has to be the most glamorous decade in Indian Cricket. We had some really good-looking guys and they were dating some gorgeous women. Tiger Pataudi himself was dating the leading film star of India - Sharmila Tagore. There was Salim Durani, who was a film star himself in his own right. There was Budhi Kunderan - he was short and dark, but he wore tight trousers on and off the field and dated models. Farokh Engineeer had a lot of exotic dates if I might say. Even now I think Farokh makes heads turn, although I'm not sure if he's able to turn himself. And then there was my hero, ML Jaisimha. He always had women around him. At that stage, when your hormones are raging, you say to yourself, 'Wow! This game must be something'. So, for my generation, the incentive to take up cricket was that. I'm not too sure about what the current generation thinks - for them maybe it's the IPL. But for our generation it was really the mere possibility that we could meet a film star, date her, take a model out. That was the incentive. Well, it didn't quite happen that way. Of course, Ravi [Shastri] has been rather more successful in that regard. Tiger also was an outstanding fielder. I think in the history of Indian cricket, Tiger has to rank among the top-three Indian fielders ever. Tiger himself, Eknath Solkar, who is no more with us, and Mohammad Azharuddin - these three would be, in my view, the top-three fielders of India. Wherever they stood - close-in, in the outfield - they were outstanding. Tiger, with that one eye, could hit the stumps quite regularly - pretty much as regularly as a Jonty Rhodes or a Ricky Ponting did. Whenever the run-out opportunity was there, Tiger hit the stumps. And that is the crucial thing. If you hit the stumps and the run-out opportunity is not there, it doesn't really mean much. And Tiger was a prankster. I think there would be many of my former team-mates who would stand up and put their hands up to say that they were the victims to his pranks. With the media he was always playing up. He went knocking on his team-mates' doors wearing masks and scaring the living daylights out of them. And this is something you would not really expect of someone who was of royal lineage. Yes, he was a man of few words but he was a practical joker as well. I remember Vishy [GR Vishwanath] was one who suffered. When they went to play a match in Bhopal, they suddenly decided that they'd go on shikaar [hunting]. None of the guys had ever held a gun before in their lives apart from Tiger himself. But they all agreed to go. As they went into the jungle, suddenly they were surrounded by these dacoits. Everybody had a gun up their throats and it was quite scary. Vishy, till today, he sweats every time he thinks about it. Erapalli Prasanna tried to run from there and was shot. Tiger wasn't able to control his laughter so the dacoits took him away into the bushes. They tied poor Vishy to a tree. Vishy was, of course, given by Tiger his silk kurta and all the brocades, etc. for the day. So the dacoits said, 'no, no, you are the Nawab'. Vishy was trying to explain to them that he was just Gundappa Vishwanath and that the Nawab of Pataudi was somewhere else. They said, 'no, look at your outfit. You are the Nawab'. There was another cricketer as well who was tied to a tree - I will not name him. Every time he said that he should be let off as he was an Indian Test cricketer, the gun came closer. It was quite an experience until I think the time when Tiger and Prasanna, who were supposed to have been shot dead, walked through the bushes. By that time the joke had gone on too much. The dacoits were actually Tiger's servants who had dressed up and taken these people hostage. It was that aspect of his character that he brought to the game as well - the fun aspect. And I think that's the aspect that perhaps, we could do more with in modern day cricket. Yes, the intensity and the passion has to be there when you're representing your country or any team for that matter. But along with it if just a little fun element comes in, I think it will be fantastic for the game of cricket. Cricket today is in a very, very happy place. I think there are more people playing the game and in more countries of the world. There are also more millionaires playing the game today. Twenty20 cricket is helping to globalise the game, taking it to emerging countries like America, China and maybe Europe as well. And I think that is the format you should probably look at if you want to globalise the game. But I think - and this is what Tiger used to say as well - that we keep on tinkering with the game too much. We keep making changes in the game and that makes it difficult for the countries that are not cricket savvy to understand the game. The success of football, golf and tennis is because the rules are very simple. They're very easy to understand and therefore, there's no confusion in the minds of those who have never played the game before, or in whose country it's not a primary sport. That's something that cricket administrators need to look at. However, I still believe that Test Cricket is still the pinnacle of the game. It is, as all the players present here will readily acknowledge, the format by which they're going to be recognised as good, great or ordinary players. Performances in the T20 and 50-over format are well and wonderful but at the end of the day it is Test cricket by which the players know they're going to be rated. Administrators, particularly in the four or five major countries out of the ten Test playing countries, need to make sure that Test cricket is the pinnacle. For that you need to have pitches which are balanced rather than the ones which are one-sided. We need pitches on which the best are tested against the best because at the end of the day it's not just the test of your technique or skill. It's the test of your courage and temperament. I've always believed that it's the temperament that separates the men from the boys and that can only be found out in the cauldron that is Test cricket. That is something I would request all the administrators to have a look at. Ravi Shastri and Mr. N Srinivasan already said that Tiger Pataudi was a man of few words. We are also in the age of T20. So, I'm not going to carry on. There's a Test match to be played in a couple of days and it's the beginning of a series that has always been an exciting one. I want to wish both teams plenty of luck - just a little bit more for the Indians as they need it a bit more than the Australians do. The Australians have been winning while the Indians have not. I hope and I know that it will be a wonderful series. India-Australia series has always been very well contested and well-fought. But just like Tiger did, let there be a bit of fun element as well in the game. When a batsman scores a fifty or a hundred or a bowler picks up a wicket, let there be a little smile. A little bit of a smile makes a huge difference. It makes the television viewers and everybody feel great, and the youngsters will like to take up the game as well. Once again, I wish both teams the very best. 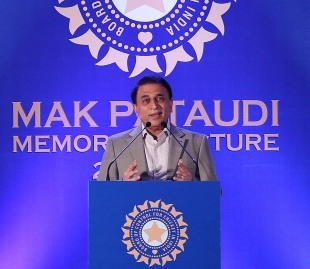 To Mr. Srinivasan and the BCCI, thank you so much for inviting me to speak at the inaugural MAK Pataudi Memorial Lecture. I guess, once an opening batsman always an opening batsman. Thank you so much everybody. And Tiger, if you're up there and listening, just want to say a big thank you to you as well, for enriching this game and on behalf of all those who came in contact with you. Ladies and gentlemen, thank you so much.